A civil trial took place on Friday July 20. The result of the trial was a bargain between the defense for Spindletop and the prosecutor. The District Attorney for Montgomery County informed us in a public press conference that Leah Purcell had agreed not to appeal the court’s decision, in return for being allowed to continue to run a dog-boarding business and to retain ownership of 11 of the confiscated dogs that she claimed were her legal property. The only penalty she received was that she is not permitted run a dog rescue in Montgomery County for two years. Most of us were stunned. This was the penalty for having abused dogs to the point of death? For lying to people? For soliciting, accepting, and keeping monies from people while defaulting on her promises to care for, work with, and find homes for their dogs? 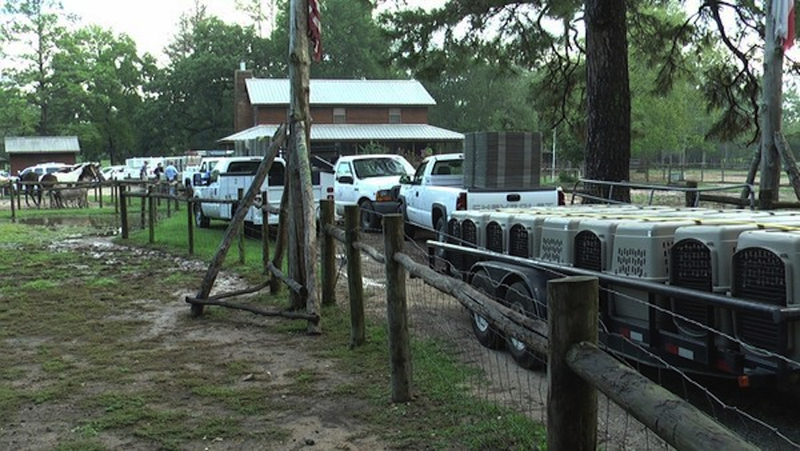 Today, August 3, 2012, barely two weeks after the raid, Spindletop is again legally open for dog-boarding! This story is not over. You will hear more as it unfolds. And we dearly hope that part of the story will include our finding of Scarlett or at least discovery of what happened to her and to many other dogs still missing and unaccounted for. I flew to Houston from California, and Brayton drove there from New Orleans. We met there Saturday night, to be ready early the next morning for our pre-arranged appointment at the HSUS/AFF holding area at the Montgomery County Fairgrounds in Conroe. We were told that once we identified ourselves, proved that we were the legal owners of a dog, and proved that we had paid money to Spindletop to board/rescue that dog, we would then be permitted to spend some time looking through a book of photographs of the confiscated dogs. There was one photo of each dog in that book, period. Not a great photo, not a mug shot plus a profile. Just one photo of a polaroid type, about 3” by 5” in size, taken shortly after they were seized from Spindletop. We had been emailing nonstop with about 50 other dog-owners in the days before this. We had been sharing photos and careful descriptions of each of our dogs, including microchip ID numbers for the dogs who had them. We made and had professionally printed several copies of glossy posters for 14 of these dogs for whom we had received information in time before we travelled. For another 7 dogs, we had good photos and descriptive information on our laptop, and these came with us. So after we passed our qualifications test and were allowed into the building where the book of photographs lay on a table for us, we set up our laptop and the posters all around us, ready to work intensely to compare every single photograph in that book with the photos and descriptions we had of these 21 dogs. We expected the HSUS/AFF volunteers to be thrilled by our preparations and readiness. Instead, they gave us back the packets of posters we handed them, asking us what we expected them to do with them. (!) They did not seem pleased by our taking over the table with our posters and laptop. But there were no other dog owners there searching on that Sunday morning, so we figured we weren’t doing anything wrong, and we chose to presume that maybe these people were just in ill humor because they had to be working there on a beautiful Sunday morning. ACE, ALASKA, ANGEL, BEGONIA, BISHOP (Toledo); BISHOP (Halt), FAWN, HANNAH, HAWAII BLUE, HOOCH; JAX, JERSEY, MASON, MEA, MICHAEL; NERO, NINA, PLUTO, POP, RIVER; and our SCARLETT. Fourteen of the above photos are the posters that we had made for those dogs -- Alaska, Angel, Begonia, Bishop (Toledo), Hannah, Hooch, Jax, Jersey, Mea, Michael, Pluto, Pop, River, and Scarlett. For the other seven dogs we had no printed posters, just photos and text descriptions of them on our laptops -- these were Ace, Bishop (Halt), Fawn, Hawaii Blue, Mason, Nero, and Nina. We concentrated so hard for the next hour that there was probably steam coming out of our heads. Alas, we saw only two blue pitbulls in the photo book, and neither of them resembled our Scarlett. It was a heartbreak for us not to see Scarlett, a disappointment that felt like being hit by something heavy and hard in the chest. We swallowed it and resolved that we would spend the rest of this trip trying to find others’ dogs for them, and that later on we would drive out to the Spindletop ranch to see if we could find any more clues about Scarlett or other dogs there. After over an hour, we had found possible matches for 13 of the 21 dogs we had been searching for! The possible matches were for: Ace, Alaska, Angel, Begonia, Bishop (Toledo), Fawn, Hooch, Jax, Jersey, Michael, Pluto, Pop, and River. We handed our notes to the HSUS volunteers, expecting they would be eager to see all the photos and descriptions we had of these 13 dogs for whom we felt we had good possible matches. But they did not seem very pleased! They took our notes and the posters that we had for 11 of the possibly matched dogs. We offered to let them take my laptop so they could have photos of Ace and Fawn, too, in order to check those matches, but they refused. One of the volunteers offered her email address so that we could email her photos of Ace and Fawn and any better photos we had of the other possibly matched dogs, so I immediately emailed her photos of Ace and Fawn. I also quickly e-messaged the owners of the other dogs we were searching for and told them that they should send more and better photos of their dogs to this woman as well as to the other HSUS and AFF contacts. While the HSUS volunteers were gone for the next 15 minutes, we continued checking the photo book for any more matches, and checking and re-checking the ones we had already noted. Realizing that the best judges of whether these were good possible matches would be the dogs’ owners, not us, I quickly took out my cell phone with its tiny camera and snapped photos of 17 of the photos in the book that looked like possible matches. Those 17 photos corresponded to only 9 of the 13 dogs we thought we had matches for, but that was all I had time to take before Brayton pointed out to me large signs on the walls forbidding the use of cell phones inside this building. I hunkered down with my phone and discreetly emailed these 17 photos to the owners of those 9 dogs and just said in the subject line “Check These!” Yes, I knew by then that I wasn’t supposed to be using my cell phone. But I wasn’t about to not mail them to the dogs’ owners, when we were this close to possible reunions. There was too much at stake here! Mea Culpa. Here are the 17 photos I emailed to owners of 9 of the 13 dogs we thought we had matched. Do you think you see possible matches between these and the photos above of the dogs we were searching for? The nine dogs we thought we might have matches for were Ace, Alaska, Bishop (Toledo), Fawn, Hooch, Jax, Jersey, Pop, and River. When the HSUS volunteers returned, they handed back our notes to me, and I saw that they had crossed out almost every match we had noted! They disagreed that any of the dogs we were searching for were there on the premises. We were nonplussed. But not beaten. (It should come as no surprise that people who rescue pitbulls exhibit strongly the quality of tenacity.) Seeing that we weren’t giving up, the woman who had given us her email address told us that the only way they would be persuaded to revisit some of our suggested matches would be if we could provide more convincing photos of the dogs we were searching for. Knowing that in the past ten minutes the dog owners I had emailed had been sending her more photos of their dogs, I happily told her to check her email, those additional photos were probably there already! Oops, mistake. Anger flashed across her face and she exploded at me for having given out her email address because now she was getting all these emails on her phone from people she didn’t even know! (!) Oh, I was definitely not winning any public relations awards with these volunteers today. By this time I could see that unless we could look at the actual dogs, we would accomplish almost nothing in this trip. I decided to try some persuasive logic. I said to one of the HSUS women in charge: I see that you all understand how important it is to have multiple photos from different angles showing uniquely identifying features, in order to match correctly to the actual dog in front of you. So to be fair, knowing that some of these dogs’ former owners had only recently rescued these dogs and not known them for very long, and also that some brought their dogs to Spindletop as long as a year or more ago, how can you expect them to be able to recognize their dog with certainty from just a single small photo of them that you provide? And how is it reasonable to expect that these rescuers would still have or perhaps ever had a full portfolio of photos of these dogs, when they did not anticipate ever having to identify them a year hence under such challenging circumstances? Shouldn’t the rescuers and have an opportunity to see the real dogs as well? My brilliant logic had no effect. Out of the woman’s mouth came some rehearsed speech that didn’t address what I had said -- stuff about how these dogs were evidence in a criminal case, how they had to protect these dogs from being claimed falsely by breeders or dog-fighters and that therefore no dogs could be seen except by proven probable actual owners. All of that was totally reasonable, no argument from us. But our own credentials were impeccable, so I didn't understand the connection. Then I figured that maybe our careful pre-planning could solve these problems -- so I reminded her that these other dog owners had emailed to all in charge written authorizations for us to act as their representatives, and that these dog owners had expressly asked that we be permitted to see possible matches for their dogs while we were here! Yea, I thought! Now we can get to work! But she didn't agree. She answered that those authorizations from the other dog owners meant nothing, because we ourselves had never actually seen or interacted with those dogs. I thought to myself (but did not say aloud): “But you people have never seen these dogs before either, right?” At least I think I didn’t say it aloud. Honestly, by then I was losing my last dribbles of diplomacy. We returned promptly at 3:45pm, hoping that we might persuade the HSUS people in charge that it really did make sense to let us look at some of the dogs we thought we had matched. We were now feeling quite sure of at least 8 of the 13 matches we had proposed, so we asked again if we could possibly look at the dogs in those particular kennels? Their answer was again NO. 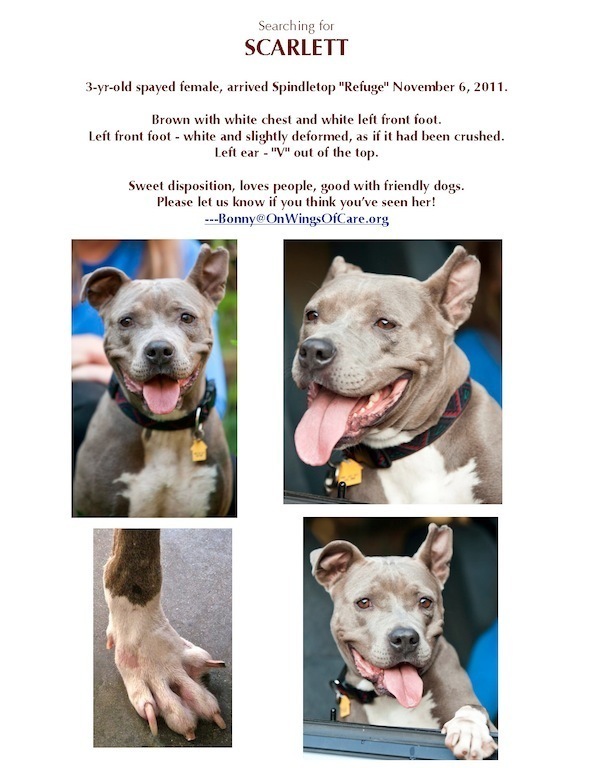 But, they said they were willing to show us the two blue pitbulls that could possibly pass for Scarlett, and they would also permit us to look at three dogs which they had "confirmed 100%" belonged to one of the other dog owners whose dogs we were looking for. I blurted out “We have not traveled 2000 miles to look at three dogs who have already been found!” But I quickly quieted down, deciding that we had better accept this offer graciously and just get ready to look hard and fast at every other kennel we could manage to see on the way. We learned that “confirmed 100%” meant that the volunteers agreed, based on visual comparison with photos and by matching microchip ID numbers, that a given dog belonged to a given owner. That’s all well and good for dogs that had microchip ID numbers that the HSUS had managed to scan successfully. But that seemed like asking a lot. Many of the dogs we were searching for, even the dogs for whom we thought we had found possible matches, did have microchips, but HSUS had not found those microchips. I asked the woman, "What if these dogs’ microchips just aren’t showing up in your scans?" To that she answered “I assure you that every part of every dog’s body has been scanned for a microchip!” In other words, it was impossible that there could be a dog out there in those kennels with a microchip that they had not yet read. That seemed to me like a death toll for an awful lot of dogs who were still missing. And by this time, I was in such disfavor with these volunteers that our walkthrough was turning into a fast march. We came to the kennels and found them to be horse stalls with solid doors that join in the middle, their interiors visible only through a narrow vertical gap no wider than a dog’s nose, maybe two inches at most. The HSUS women required that we walk in the middle between the two rows of stalls, at least four feet from the stall doors. One woman walked in front of us and one behind, to make sure that we didn’t stop walking or slow down too much. If a dog happened to be showing him or herself just perfectly so that we could see them in the two seconds or so that it took us to pass by the narrow vertical slot, we could catch a glance at them from four feet away. Sometimes we could tell whether the dog was brown, or brown and white, or black! But not much more than that. We were permitted to pause in front of the two kennels with blue pitbulls in them; sadly, we could see that neither of those dogs had Scarlett’s unique “V” out of their left ears, and as far as we could see (we’re still not really sure), neither of them had Scarlett’s white, splayed left front foot. We couldn't even see if they were males or females. I wanted to linger there just to linger, as if maybe some intuition would come to me if I could just sit there quietly among all the dogs for a while. But the gals would have none of that. So we kept marching, and I took notes as fast as I could, while the woman from Animal Control behind me kept barking at me to keep walking. The three dogs already "confirmed 100%" were: HAWAII BLUE, MASON, and NINA. Another dog we had not seen in the photo book, MEA, was the subject of a disturbing rumor we had first heard late Saturday night. Sadly, that rumor was confirmed on Sunday, and Mea's desperate owner was finally told by the authorities on Monday that Mea had escaped during the raid on Spindletop, and had been hit and killed by a car on the road. This left four of the 21 dogs for whom we had been searching, and for whom we had found no possible matches: BISHOP (Halt), HANNAH, NERO, and our SCARLETT. ALASKA, BEGONIA, HOOCH, MICHAEL, POP, and PLUTO were claimed by New Jersey Aid for Animals. ANGEL was claimed by Reunion Rescue (Cindy Marabito). RIVER was claimed by Kelly Myles. JERSEY was claimed by a rescue out of Ocean City. ACE, FAWN, BISHOP (Toledo), and JAX. Cynthia Merriman believes we have found a certain match for her Ace, and she will be searching for her Fawn in person this week. Cynthia's other three "100% confirmed" dogs are also being retrieved by her this week -- HAWAII BLUE, MASON, and NINA. Owners of Bishop (Toledo) and Jax have not arrived on site yet to confirm matches. Since MEA was confirmed dead, this leaves only four dogs our of our original 21 for whom we were searching that still remain missing. Two of them -- BISHOP (Halt) and HANNAH -- might no longer be alive, due to the considerable length of time they had been at Spindletop (May 2011 for Bishop) and their poor physical condition on arrival (Hannah). The remaining two missing dogs -- NERO and our dear SCARLETT -- were each young, strong, healthy dogs when they arrived at Spindletop this spring and last November, respectively. They are still being sought actively. We drove out to Spindletop during the afternoon last Sunday. We expected full security and police cars there, considering how difficult it had been for us as proven dog owners to see the confiscated dogs back in Conroe. But to our surprise, the ranch was almost deserted, except for some peacefully wandering chickens, a horse, and one young woman we saw walking around the house where we had met and introduced Leah to Scarlett last November. The ranch looked neat and buttoned up, and there was nothing to keep us from walking in and looking all around. With at least one mass grave having been found on the property, and many more dogs whose status was unknown, we hoped that police had already scanned the property for microchips and more graves, and that they had thoroughly documented the conditions of the insides of the buildings that had housed the dogs. But today, the place was so open and deserted it seemed that we could have camped out there and looked for graves ourselves. Here, at the actual scene of the crime, there seemed to be no concern about protecting evidence. But the dogs themselves -- those were guarded so tightly that even authorized rescuers could not see them or have photos emailed to them! We were mystified. Whether you’re adopting or rescuing or fostering a dog, make sure he or she has a microchip ID with your and any other relevant contact info associated with it, and keep a careful record of that information and ID number, for as long as that dog might be alive. Take a careful and full set of photos of a dog in your care, before you board, foster, or otherwise leave that dog in someone else’s care, and retain those photos for as long as that dog might be alive. Never leave a dog for boarding or fostering without some kind of signed contract and full contact information for the person(s) with whom you leave the dog. Research the background, reputation, and status of any business or nonprofit or person with whom you leave a dog, before you leave the dog with them. Trust your intuitions and gut feelings, especially any concerns or uneasiness, about a person or business with whom you might leave a dog. Follow up on them before you leave the dog with them. For us, we are still searching for Scarlett. With help from some of the other rescuers we’ve met through this Spindletop travesty, we’ve looked through every pitbull advertised in every shelter for the past several months in 13 states so far -- Texas, New Mexico, Oklahoma, Arkansas, Louisiana, Georgia, Tennessee, Missouri, Kansas, Alabama, Mississippi, Virginia, and Florida. We are planning another trip to Texas soon, and we hope to speak with Leah Purcell directly to ask her about Scarlett. We are not about vengeance or punishment; we will leave that to the law and to public awareness, and we will support those avenues all we can. But we need to find closure about our Scarlett, just as so many other desperate owners need about their dogs. We won’t stop until we find out where and how Scarlett is. Any tips or help from readers will be much appreciated.